In Vallecas, thanks to their 5-1 win Luis Enrique’s Barça side have established yet another record, most matches unbeaten in all competitions. The previous record in Spanish football stood at 34 matches, held by a Real Madrid side from 1988/89 with Dutchman Leo Beenhakker as coach. 27 years later, the blaugranes have eclipsed their big rivals by reaching 35 games undefeated. The run encompasses the league, Copa del Rey, Champions League and Club World Cup competitions and the streak could well be extended in the coming weeks. In the near future Luis Enrique’s team have two targets in their sights. First is the record set by English Nottingham Forest of 40 games unbeaten in all competitions, a run that came to an end in December 1978. However, the record in all competition in the main European leagues was set by Italian club Juventus between May 2011 and May 2012. La vecchia signora went 43 games without defeat in the league and Italian Cup, recording 26 wins and 17 draws. 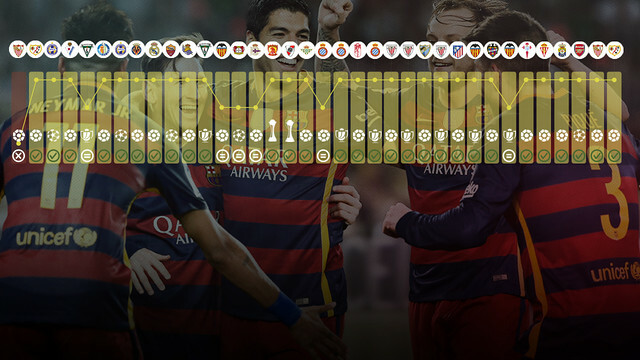 Barça already have 29 wins in their run of 35 games unbeaten.